It’s ironic that I hate cold weather but I love buying new coats for the family each year. I love seeing my kids all bundled up in layers. Perfect for cozy long weekends at our A-Frame up in the mountains. 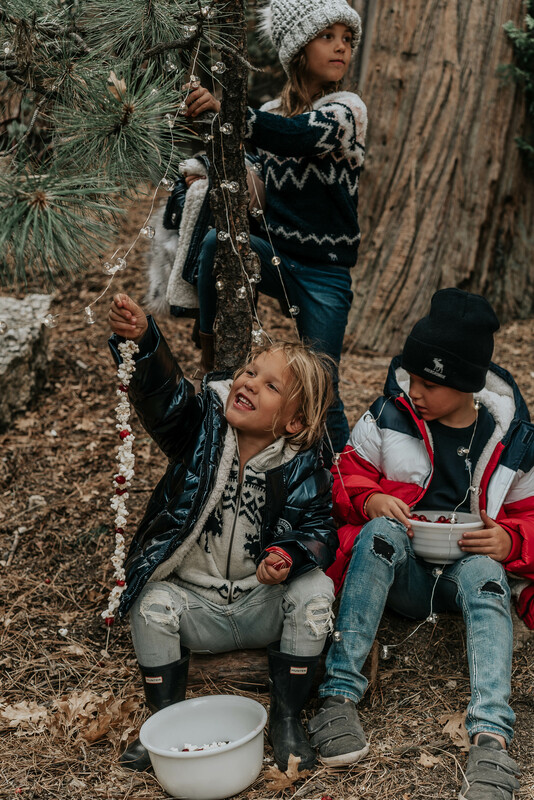 Wearing our new winter coats, we decided to string popcorn and cranberries for a cute/ugly little pine tree we found next to our mountain A-Frame. The kids had a blast decorating the tree we found. Thank goodness for battery operated LED lights. They gave this sad little tree a little sparkle. After some popcorn fights, we moved up the hill and the kids built a pretend campfire as they ate candy canes and talked about what they want for Christmas. The air smelled of pine trees and was refreshingly crisp. 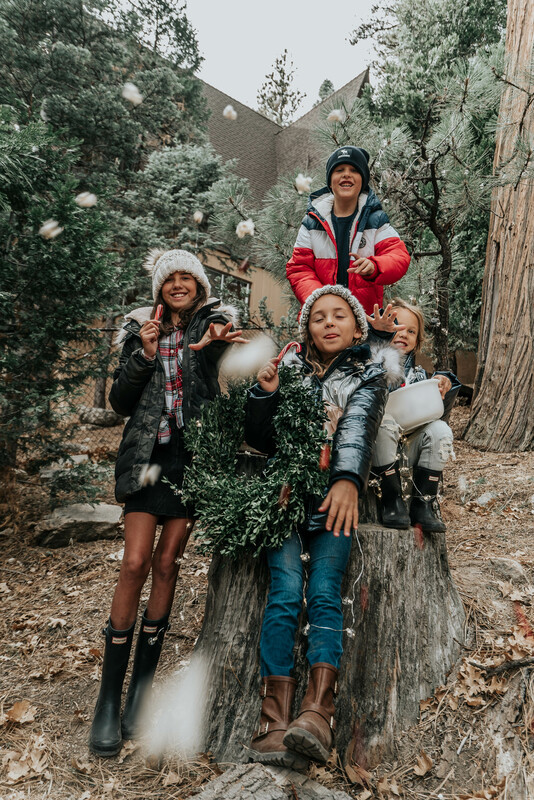 As we plan on spending lots of days in the snowy mountains this winter, I’m lining up key must-have winter basics your kids will actually wear. No fights, right!? I’ve learned a few things on what to look for when selecting kids outerwear. 1) Purchase coats that aren’t too bulky or stiff. If the kids aren’t comfortable moving in it, they won’t wear it. 2) Look for coats that have attached hoods. No more losing hats! 3) The coat needs to be easily cleaned and machine washable. I found our coats at Abercrombie Kids. 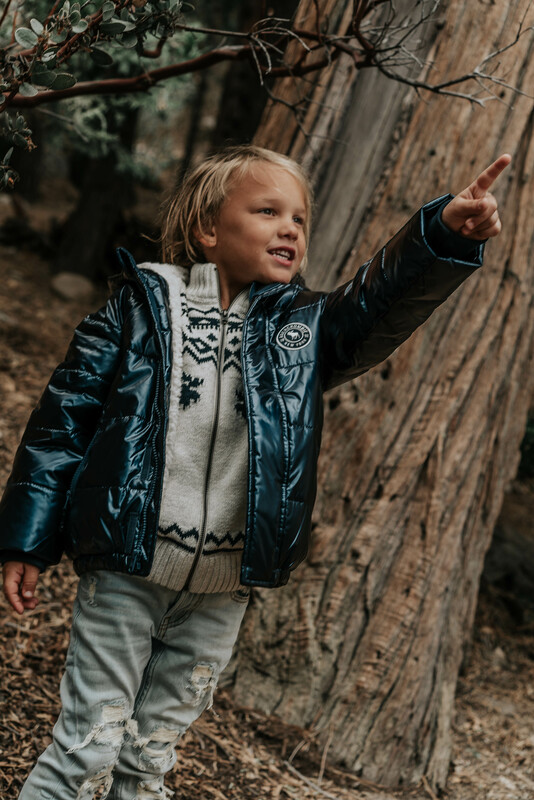 Their outerwear kid’s collection is on point and as a stylist, I approve. 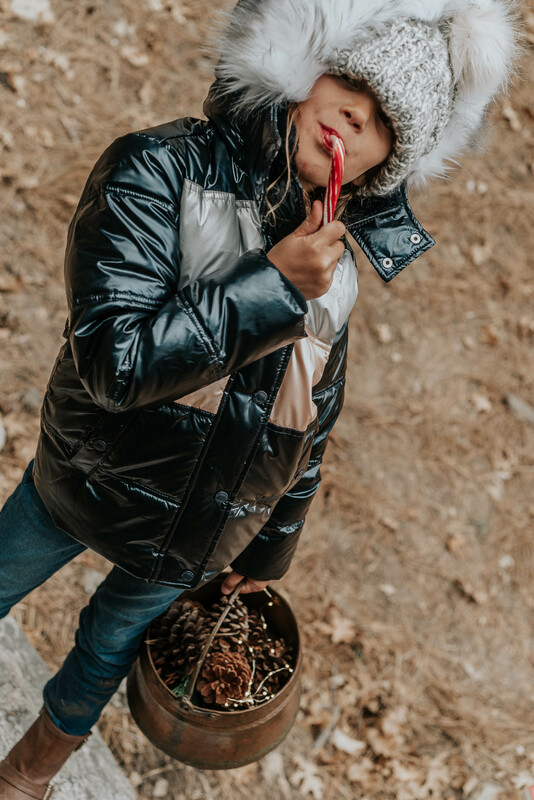 I’m especially fond of the Essential Puffer Line and the shiny color options, which the kids loved and I know the material will clean up nicely after they’ve played outside. The girls are wearing the Essential Puffer Coat and the Adventure Parka. The girls’ coats have faux fur hoods and the color/pattern selection will please any kid. My youngest girl chose the shiny navy blue stripe and my oldest, outdoorsy, daughter chose the cute green camo with pink faux fur lining. 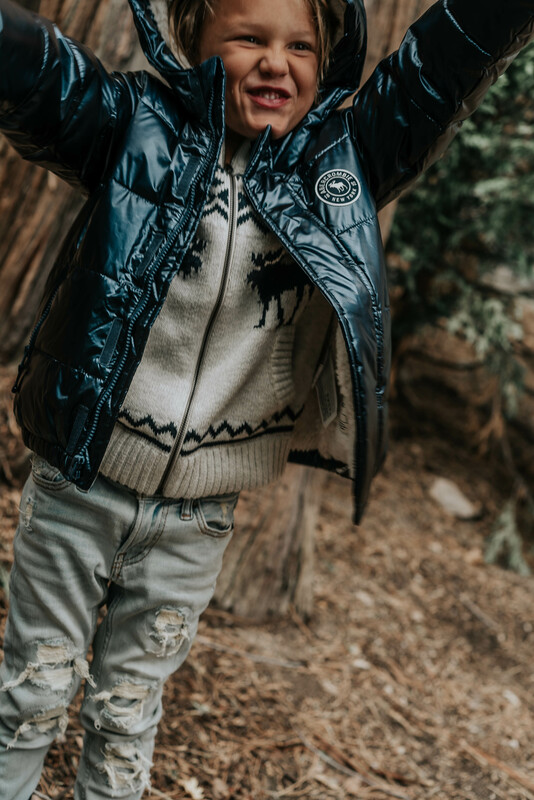 For the boys, the Essential Puffer Coat keeps their movement unrestricted while they play. The sherpa-lined hood is so cute and cozy too. I layered the kids with plaid button-down shirts, zippered sweaters, sweatshirts and ripped denim jeans with patches. When the temps drop lower, my daughter will wear tights with her black denim skirt. I love how their outerwear all pulled together nicely. We are ready for a real mountainside campfire and some s’mores. Happy wintering!